The founding fathers stated in the Constitution that the President "shall from time to time give to Congress information of the State of the Union and recommend to their Consideration such measures as he shall judge necessary and expedient." It wasn't spelled out HOW the president was to do this or even when such an update should be given. The State of the Union Address has taken many forms since the birth of our nation. It has come to be an annual speech given by the President of the United States and is done in the month of January. In 2018, the address will be given on January 30th.Learn about the history of the State of the Union Address with this internet activity so you can WOW your friends with all you know about the history of this yearly event! THERE are 10 web questions in the complete resource. 1. Originally called the "Annual Message", it was Franklin Delano Roosevelt who first used the phrase the "State of the Union" address. Interestingly, the words "State of the Union" appear in the U.S. Constitution. 2. Although there aren't assigned seats for the State of the Union Address, usually Senators sit on the sides and members of the House sit in the middle of the House chamber. 3. Benjamin Harrison didn't give a State of the Union Address as he was only president for 31 days. He caught a cold during his Inauguration Day ceremonies and died soon after. He was the first president to die while in office.The only other president to not give a State of the Union Address was James Garfield. He was assassinated. 4. During George Washington's first State of the Union Address,in 1790, he welcomed North Carolina into the union. THERE are 8 Did You Know? facts in the complete resource. What is a designated survivor? How is a person selected for this task? Why do you think Presidents like to give a State of the Union Address to the Congress and nation? Why didn't President Harrison and President Garfield give a State of the Union address? 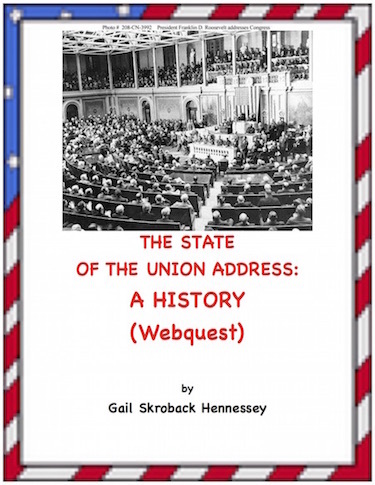 Before giving the web quest activity to the students, ask if they have any prior knowledge about the history of the State of the Union Address.Share with students that the Capitol Building is NOT spelled the same as the capital city of each state. Have groups of students do the internet activity and regroup and share the information that they learned. THERE are 3 extension activities and the Key to both the webquesr and the comprehension questions. There are 6 Questions in this handout for students to use as a homework activity or as a extra credit activity. 3.Do YOU Know Your Presidents is a series of three challenges. Each challenge worksheet has 25 questions(with 3 choices). The first challenge is the easiest with the third, the hardest.